Ah, Oui Paris- Part One. Arriving at Manchester airport some time around 5am, Saturday the 30th of June, it was fair to say I was a liiittle bit nervous. With my clothing all rammed into the suitcase and two magazines to keep me occupied, now was the time to board the plane. 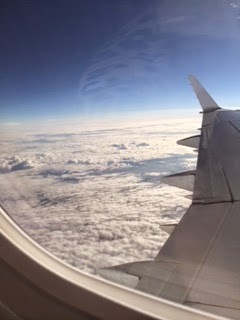 If your like me and never flown alone before(yes im pathetic), you’d understand how jittery I was. Simply because I couldnt cling on to my travel companion for dear life when the tiniest bit of turbulance occured ( told you I’m pathetic). However, having ‘manned up’ and realising it’s just a one hour flight, I told myself I could do this. If Lauren Conrad can then why can’t I…? Upon arriving at Paris, a tired, confused and not very french literate Emma, strolled through the airport to board the train. 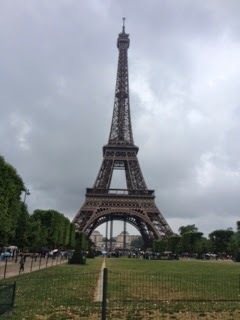 After 40 painfully humid minutes later, I’d rolled on up to central Paris, eyes wide and excitement building. Roll on the mmorning and the start of the long awaited Internship.However, until then it was time to act like a tourist and hit the Champs Elysees. After several hours of trapsing around the Centre of Paris, visiting monuments and stopping at approximately 4 cafe’s every few hours, it was time to shop. Gazing lovingly along the design filled stores I not only dreamed of a time to own the goods but was in amazement at the window displays. Strolling away from the dream goods and hitting up the shops my bank could afford- hello Zara and H & M. Gazing around it had occurred to me that as much as I love the higher end dream, it’s in actual fact the high street that continues to provide for us “paupers” and provides so, so well. For months and months I had torn myself away from buying s certain necklace, that if I’m honest, had wanted so, so bad. As I entered the Zara sale…wo, wo, wo, what was infront of me? 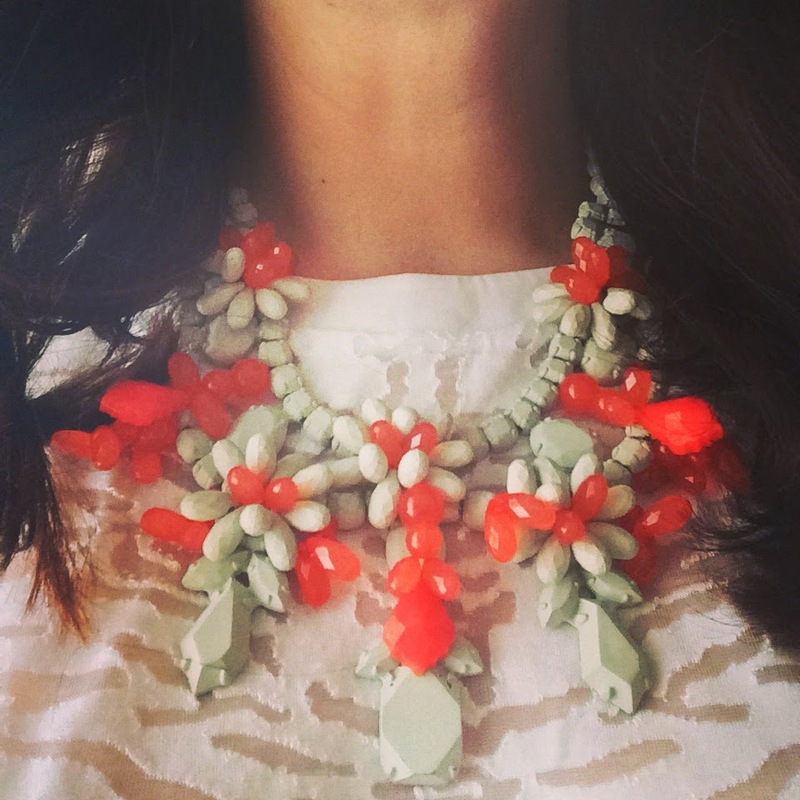 Only the b.e.autiful necklace at a fraction of the price-C’mon Paris. After swiftly picking up the necklace, stuffing my face with a cheese and ham baguette and continuing to roam, I’d reached the piste le resistance- lo and behold the Eiffel Tower and out comes the inner tourist. 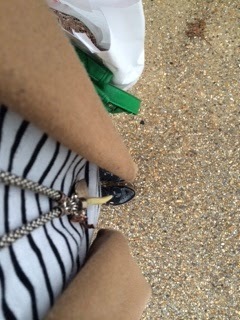 After ANOTHER hot chocolate (and macroon from Lauduree,) i’d decided it was time to go home to sleep. As being fresh, bright and effortlessly fashionable(er, yeah right), is much harder than you think on just 4 hours sleep. Tucked up in bed, alarm set and giddiness rising I closed my eyes to drift away as tomorrow was going to be the best day. 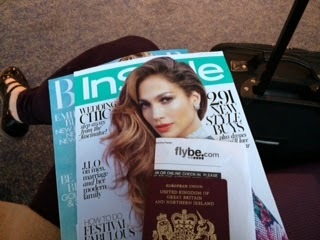 And we’re off: Magazines, Passport and drink in check. In flight entertainment: A woman, a hymn book and the joy of come by ah…for an HOUR. 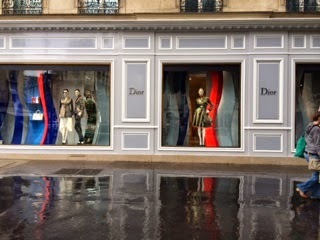 Dior Windows and rainy days. Satchel Bag: Oasis ( pretending to be Mulberry…I wish). 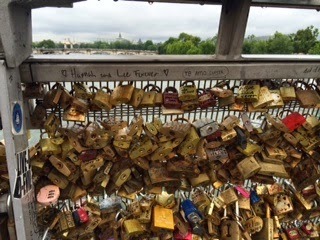 The Iconic love lock bridge: Searching high and low ( ridiculously/ looking slightly weird) for Abi and John’s declaration (post proposal -Sept 2013). Rainy day, tiredness and the Eiffel Tower: Iconic in it’s being, and effortlessly beautiful…even in the rain(could of been sunny for me, right?). With queues down the road and rain soaked dolly shoes, it wasn’t the time(I didn’t have it in me) to go to the top. Zac Posen was calling my name and so was bed…oh God it’s 8:15pm. -Read back very soon for more details/ ramblings from me, on the start of the Internship, ridiculously expensive yet beautiful dresses(try $21,000), and lots more photos! Next Post Introducing Zacposen…Paris part deux.